When shadows was first introduced, I desperately searched for prim eyes to wear cos shadows made texture eyes disappear. Now that the disappearing eyes bug is fixed, I find prim eyes less appealing, but definitely useful for wearing two different eye colors at once. These new Candy eyes from Hays Uriza are so lovely! They look great in natural and unnatural colors — and you can mix-and-match ’em. The Eyes Candy HUD is scripted to change pupil size, eye color, glow, and size. 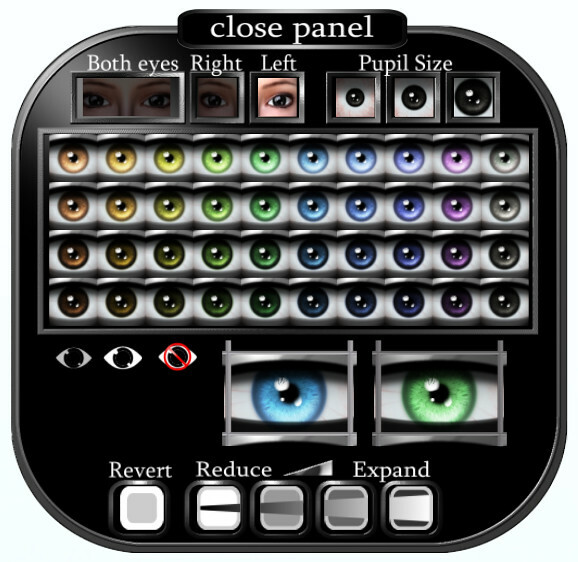 /Update/ I forgot to say that texture eyes are also available, if you don’t want to wear prim eyes. I searched for the right eyes for quite a long time. But at the end I ended up Poetic Colors from Lano Ling. They may not be prim eyes but it is like your watching into a soul. It is almost like you see a reflexion from the person close to you in your eyes. You are getting 3 differend sizes. Try the demo its worth to take a look. That Clawtooth looks good on you Gogo. It’s a great colour for you too! Apparently they’re prim only if you buy the HUD. If you buy a single version, they’re regular eyes, and there’s nothing on the signs to indicate that, sadly. I bought one pair and they’re not prim eyes. Drool…I bought a hud from them when you first posted about them how long ago was it? over a year I think. And I’ve never really liked any eyes but them. These look amazing but I have a feeling they are probably as expensive as the old set so not sure if I’ll get them. But if you have a set from them it’s well worth it for the variety and quality of the product.